Kaltag (KAL-tag) (Ggaał Doh[pronunciation?] in Koyukon) is a city and village in Yukon-Koyukuk Census Area, Alaska, United States. At the 2010 census the population was 190, down from 230 in 2000. Kaltag was a Koyokon Athabascan area used as a cemetery for surrounding villages. It is located on an old portage trail which led west through the mountains to Unalakleet. The Athabascans had seasonal camps in the area and moved as the wild game migrated. There were 12 summer fish camps located on the Yukon River between the Koyukuk River and the Nowitna River. Kaltag was named by Russians for a Koyokon man named Kaltaga. There was a smallpox epidemic in 1839 that killed a large part of the population of the area. After the Alaska Purchase, a United States military telegraph line was constructed along the north side of the Yukon River. A trading post opened around 1880, just before the gold rush of 1884-85. Steamboats on the Yukon, which supplied gold prospectors ran before and after 1900 with 46 boats in operation on the river in the peak year of 1900. A measles epidemic and food shortages during 1900 reduced the population of the area by one-third. The village Kaltag was established after the epidemic when survivors from three nearby villages moved to the area. There was a minor gold rush in the area in the 1880s. In 1906, gold seekers left for Fairbanks or Nome; however, the galena lead mines began operating in 1919. Kaltag was downriver from the mines and grew as a point on the transportation route for the mines. It declined in the 1940s as mining declined. The old cemetery caved into the river around 1937. An airport and clinic were constructed during the 1960s. Kaltag has a week long Stick Dance (memorial Potlatch) every two years that draws visitors from many neighboring villages. This Potlatch is sponsored by relatives of the recently deceased, in appreciation of those who helped during their time of mourning. Much of the economy around Kaltag is based on subsistence hunting and fishing. Salmon, whitefish, moose, bear, waterfowl and berries are elements of the subsistence economy. Kaltag is located at 64°19′31″N 158°43′37″W﻿ / ﻿64.32528°N 158.72694°W﻿ / 64.32528; -158.72694 (64.325145, -158.727030) and is on the west bank of the Yukon River, 120 km (75 mi) west of Galena of 27.4 square miles (71 km2), of which, 23.3 square miles (60 km2) of it is land and 4.1 square miles (11 km2) of it (14.97%) is water. The climate is transitional between the coast and interior. Kaltag first reported on the 1880 U.S. Census as an unincorporated Tinneh village. The census of 1890 combined Anvik and Kaltag under Anvik (with a combined population of 191). It did not appear again on the census separately until 1910. It formally incorporated in 1969. As of the census of 2000, there were 230 people, 69 households, and 52 families residing in the village. The population density was 9.9 people per square mile (3.8/km2). There were 78 housing units at an average density of 3.3 per square mile (1.3/km2). The racial makeup of the city was 12.61% White, 84.35% Native American, and 3.04% from two or more races. There were 69 households out of which 49.3% had children under the age of 18 living with them, 39.1% were married couples living together, 18.8% had a female householder with no husband present, and 23.2% were non-families. 21.7% of all households were made up of individuals and 4.3% had someone living alone who was 65 years of age or older. The average household size was 3.33 and the average family size was 3.83. In the village the age distribution of the population shows 37.0% under the age of 18, 12.2% from 18 to 24, 27.4% from 25 to 44, 15.7% from 45 to 64, and 7.8% who were 65 years of age or older. The median age was 25 years. For every 100 females, there were 132.3 males. For every 100 females age 18 and over, there were 126.6 males. The median income for a household in the village was $29,167, and the median income for a family was $25,625. Males had a median income of $20,938 versus $48,750 for females. The per capita income for the village was $9,361. About 29.8% of families and 33.9% of the population were below the poverty line, including 45.7% of those under the age of eighteen and none of those sixty five or over. The Yukon–Koyukuk School District operates the Kaltag School. ^ 1996 Alaska Municipal Officials Directory. Juneau: Alaska Municipal League/Alaska Department of Community and Regional Affairs. January 1996. p. 75. ^ 2015 Alaska Municipal Officials Directory. Juneau: Alaska Municipal League. 2015. p. 81. 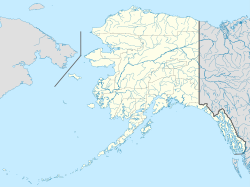 ^ a b c "Kaltag city, Alaska". Profile of General Population and Housing Characteristics: 2010 Demographic Profile Data. United States Census Bureau. Retrieved January 22, 2013. ^ "Kaltag". Division of Community and Regional Affairs, Alaska Department of Commerce, Community and Economic Development. Archived from the original on December 30, 2012. Retrieved January 24, 2013. ^ "Alaska Taxable 2011: Municipal Taxation - Rates and Policies" (PDF). Division of Community and Regional Affairs, Alaska Department of Commerce, Community and Economic Development. January 2012. Archived from the original (PDF) on 2013-04-25. ^ "CHANDALAR LAKE, ALASKA (501492)". Western Regional Climate Center. Retrieved 8 August 2018. ^ "Kaltag School, Kaltag." Yukon–Koyukuk School District. Retrieved on June 16, 2016. This page was last edited on 31 December 2018, at 21:23 (UTC).